I have been a fan of the L’Oreal lipstick formula ever since the Color Riche Rouge Magiques. These were my staples for that no-fuss, long-lasting lip until they came out with over 40 shades for the new Color Riche Mattes. More shades to choose from in an improved version of a formula I loved? I was sold! I currently have five in my collection, and am looking to add a couple more from the new Color Riche Mattes Earth on Fire collection via Lazada. The key ingredient here is jojoba oil, and L’Oreal says the lipstick is “made from light scattering gel to give the pleasant lightweight feel without drying the lips.” They must be doing something right with their formula as I find that I can wear and retouch these lipsticks throughout the day, sans reapplication of lip balm. When you think “moisturizing matte” in lipsticks, one of the first that comes to mind is Happy Skin’s best-selling formula. First launched back in 2015 via the Preview x Happy Skin Lippie Collection, what Liz said then still rings true: “It's hardly new, the concept of a moisturizing matte lipstick, but it's not easy to find.” The Happy Skin Moisturizing Matte Lippie has time and again proven to be a winning choice for those who want the matte look without the typical parched lip effect that tends to happen in those drier mattes. The cupuacu butter certainly does a good job of keeping lips soft and hydrated. Each new shade iteration of the Moisturizing Mattes comes packed with this super ingredient including my recent favorite, the Happy Skin x Love Marie limited edition collection in the shades Heartthrob and Skinny Dipping. These two are classic shades curated by Heart Evangelista-Escudero to easily take you from day to night. And what’s even better with this formula? They layer quite well, too, so you can mix up a new shade instantly. I have to admit, this next one is the least moisturizing out of all the lipsticks in this list, but it still has that lip balm/lipstick hybrid feel down pat. It is indeed glowy and glassy, as the name suggests, but I do find that I have to take extra prep before I wear this out. It is not forgiving on dry patches, so make sure to scrub your lips prior. Once your lips are flake-free, the Laneige Glasstick is a welcome addition to a daily moisturizing lip lineup. I have mine in the 2018 Holiday Wild at Heart edition in the shade Neon Orange, and I like the tint it leaves on my lips after a good enough wear time of 2 to 3 hours. When the PV girls first got to try the new Estee Lauder Pure Color Love lipsticks, there were raves all over the place. There are so many finishes and shades to choose from: you could get an ultra matte, a chrome, an edgy crème, or a shimmery pearl finish! And with an entry-level price point for the luxurious Estee Lauder brand, the Pure Color Love continues to be a great contender for your next lipstick splurge. My personal favorite for that on-the-go, no-need-for-lip-balm look is the Crème formula in the shade Strapless. This pretty mauve shade comes with the same “superfruit cocktail of Pomegranate, Mango, and Acai power oils” that Estee Lauder wrapped up in every tube of Pure Color Love. 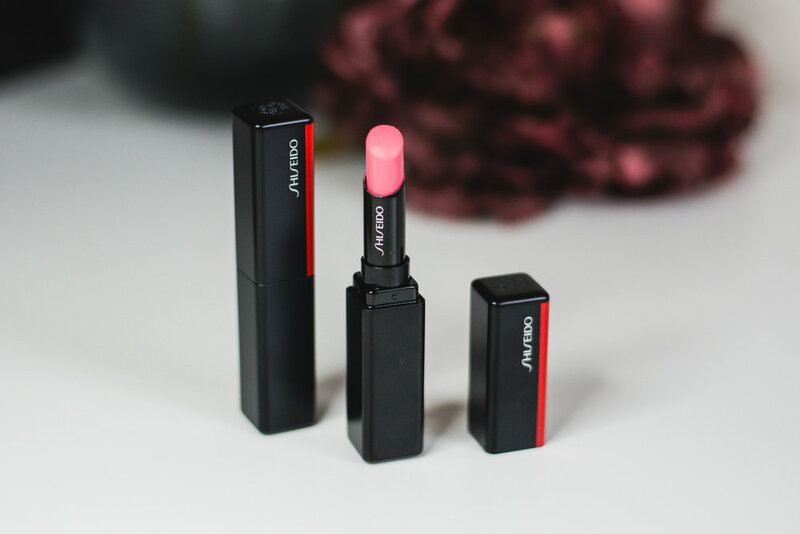 The Shiseido VisionAiry Gel Lipstick is one of the latest launches in this line-up of moisturizing lipsticks. This is one of the three new lipstick formulations (Modern Matte and ColorGel being the other two) launched by Shiseido. And while I do own a tube, I haven’t opened it yet and am relying on Frankie’s rave review of the said formula. In case you’re wondering why I haven’t opened mine yet, it’s because the VisionAiry Gel lipstick comes sealed in foil wrapping! With this careful packaging coupled with the 6-month PAO, I couldn’t bring myself to open it immediately for fear of not being able to use the lippie within the 6-month period. I think that the shorter-than-usual shelf life is due to their “Triple Gel Technology that allows high levels of pigment to converge with water for cushiony, comfortable, weightless color”. Even Liz describes this as “a liquid lipstick in bullet form” so I’m very eager to open my tube soon! Have you tried any of these moisturizing lipsticks? What’s your go-to formula for hydrating color? Are Maybelline’s Super Stay Matte Ink lippies worth the hype?